As the saying goes, "The way to a man's heart is through his stomach." Very true! I am sure one of the many reasons why my man love me so much is that I can cook yummylicious foods for him whenever he requested for it! Haha! 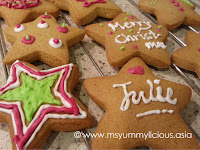 And sure enough, this gingerbread man is a special request from him. He likes the texture of a gingerbread man but doesn't like the mixed spices that most of the gingerbread man has. So in this recipe, I've only added ground ginger and ground cinnamon. Yes, i know, but these ain't gingerbread man, you may say. We couldn't find any gingerbread man cookie cutter, so we had to make do with whatever cookie cutter we have at home. The texture is a cross between a cake and a cookie. Because of the golden syrup, it has a fragrant caramelized smell and it contributes to the cakey texture. The flavor of ginger and cinnamon were well balanced with the cinnamon taste comes first, followed by the latter. 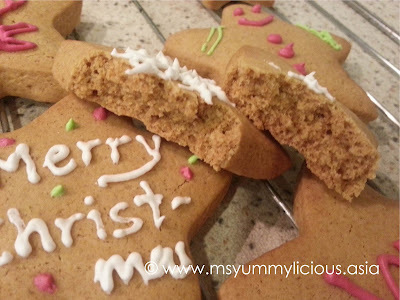 It would taste even yummier if it is in gingerbread man shape. However still a 'Two Thumbs Up' from my hubby! Can you guess what this is? 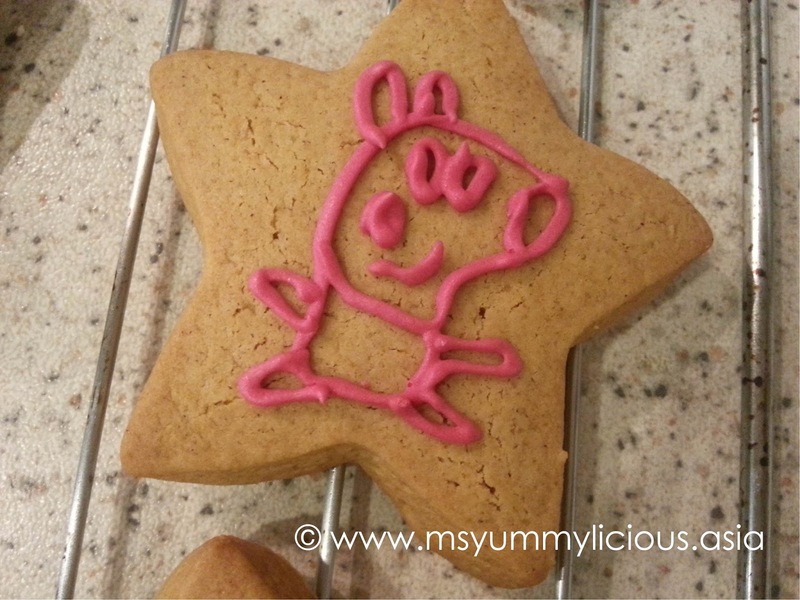 Haha, yes, it's Peppa Pig, drawn by my hubby! Even tho' the drawing is not that good, but my daughter loves it! Hehe.. it doesn't takes alot of effort to make your children happy, just know what they like! 1. Preheat oven to 180°C. Greased 2 baking trays with melted butter. 2. In a mixing bowl, whisk butter and sugar until pale and creamy. Add in the golden syrup and egg yolk and whisk until combined. 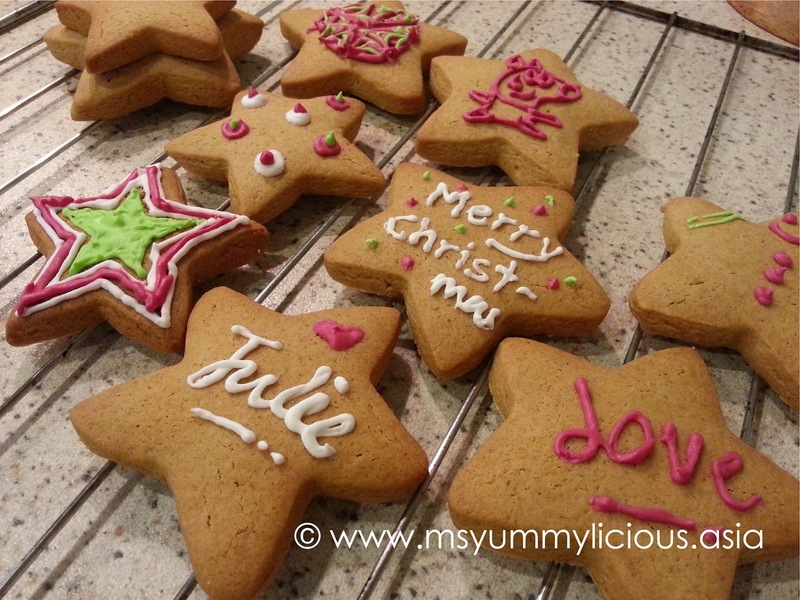 Stir in the flour, ginger, cinnamon, baking soda and salt. 3. Transfer the dough onto a lightly floured surface and gently knead until smooth. Press dough into a disc and rest in the fridge, covered with a cling wrap for 30 mins. 4. Using 2 sheets of baking paper, sandwich the dough in between and roll out until about 4mm thick. Cut out shapes using gingerbread man cutter/ cookie cutter. Arrange on baking trays with 2cm apart. 5. Bake in oven for about 9-10 mins or until browned. Leave to cool on a rack. 6. While the dough is resting in the fridge, work on your icing. In a clean bowl, whisk egg white until soft peaks. 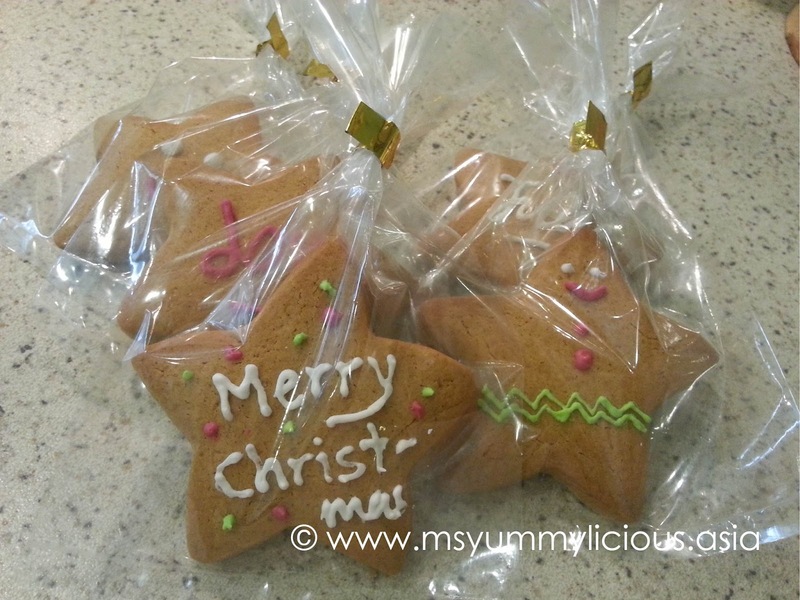 Gradually add in icing sugar and beat until stiff peaks. 7. Depending on what color you wanted to use most, divide the icing and add in the coloring accordingly. 8. 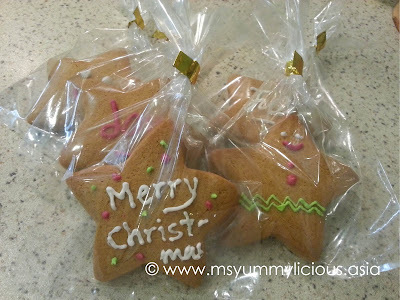 Place prepared icings in small plastic bags and keep in fridge until your cookie is ready to be piped on. To pipe, cut a small hole in a corner of each bag. ● If there is any excess dough for 2nd batch, place the dough in the fridge while the 1st batch is baking. Take it out when you are ready to cut into shapes. 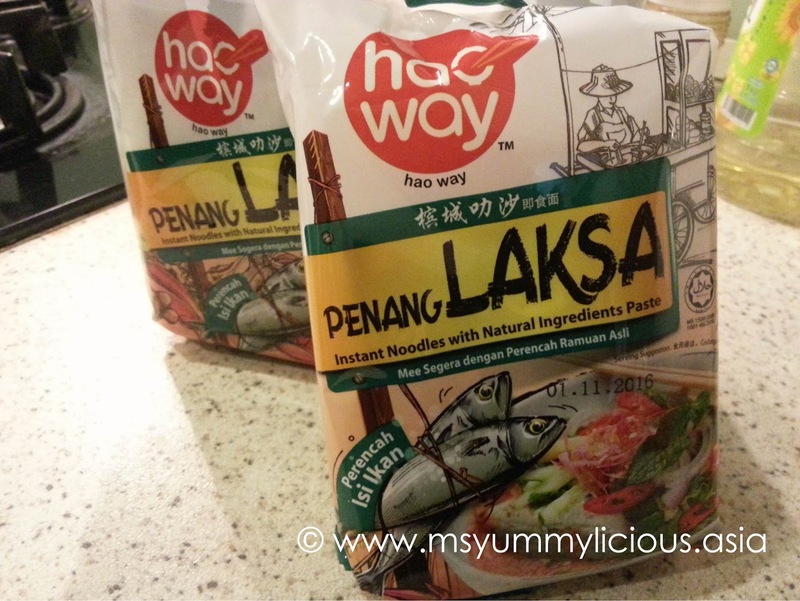 If you love to eat Penang Assam Laksa, then I would highly recommend that you check out this new instant noodle by Hao Way. It is the closest thing you can get to the real ones (in terms of you only needed to cook this in less than 4 minutes). Definitely an INSTANT Assam Laksa noodle! Bought these at Redtick.com Supermarket at SetiaWalk, Puchong. It comes with individually packed noodle and soup paste. There are tiny or I should say, mashed fish meats in the soup paste. Once you open the soup paste packet, you can immediately notice the intense fishy and prawn paste smell. In less than 4 minutes, you can enjoy your Penang Assam Laksa noodle anytime of the day you wanted. For freshness, you may add some cucumbers and onions. For more awesomeness, you may add some pineapples and gingerbud flower/ bunga kantan. You may also add a small piece of assam keping to enhance the flavor, as I personally don't think the sourish from the soup paste is sufficient. 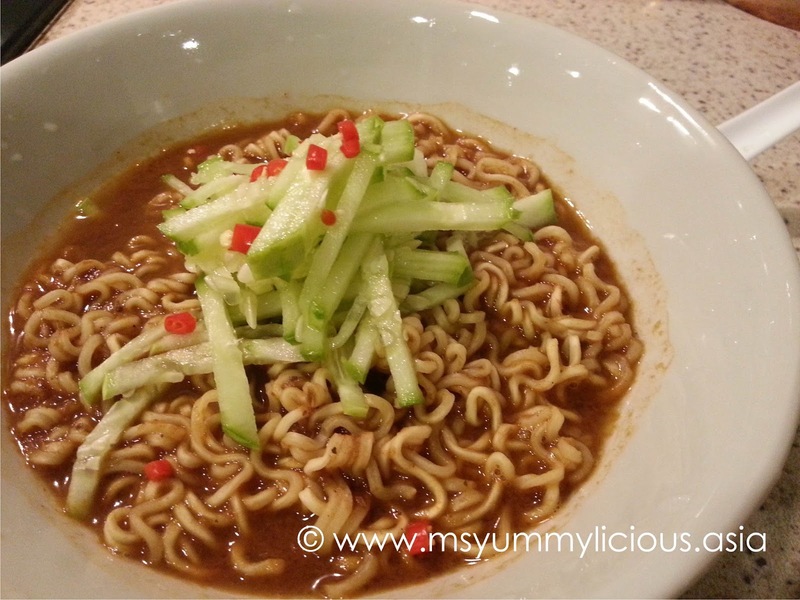 You may also substitute the noodle with lai fun/ laksa noodle (if you want). Haha... with the additional works, now it doesn't sounds like an instant noodle, does it? Don't worry, it will only takes you an additional 5-10 minutes. 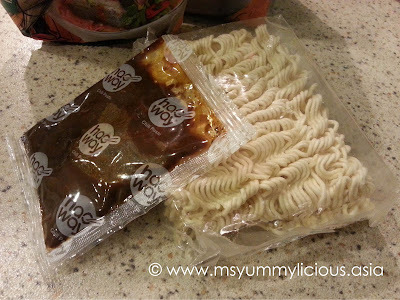 And it is only if you wanted to take this instant noodle to the next level. Be sure to cook this with your exhaust fan on to clear off the fishy smell or else you will end up with your whole house smelling like assam laksa. 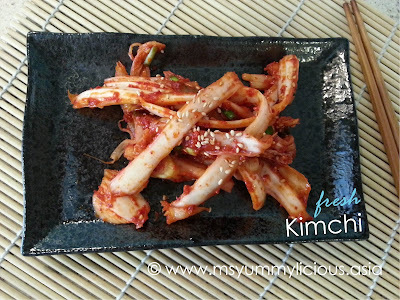 Since my hubby is so in love with my kimchi, I've decided to make him a snack with it. Using ingredients I found in my pantry, I make him this simplelicious Kimchi Bread Roll. 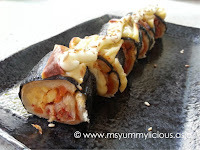 The kimchi goes very well with the seaweed and the toasted sesame seeds give you a very nice nutty taste. To top it up, the melted cheese simply compliments the whole combination. If you like, you may add some japanese mayo on the roll for a creamier taste. 1. Preheat oven at 220°C; grilling function. 2. In a small bowl, beat in an egg and whisk briefly, then season with salt and pepper. Fry the egg on a pan in a thin layer. Dish up and let it cool before cutting it into thin strips. 3. Cut the nori sheet by half or approx. 13cm length. 4. Trim off all the 4 sides of the bread. Overlapped two slices together making it a rectangle shape, then flatten with a rolling pin. 5. Cover the sushi bamboo mat with a cling wrap. Layer the nori sheet, rough side up, follow by the previously flattened bread. 6. Start adding your filling in the center of bread - egg strips, kimchi and some toasted sesame seeds. 7. Using both hands, roll the mat over so that 2/3 of the bread and nori sheet is covering the filling. Compress the bread roll as firm as you can. Continue to roll so that both ends of nori sheet meets. 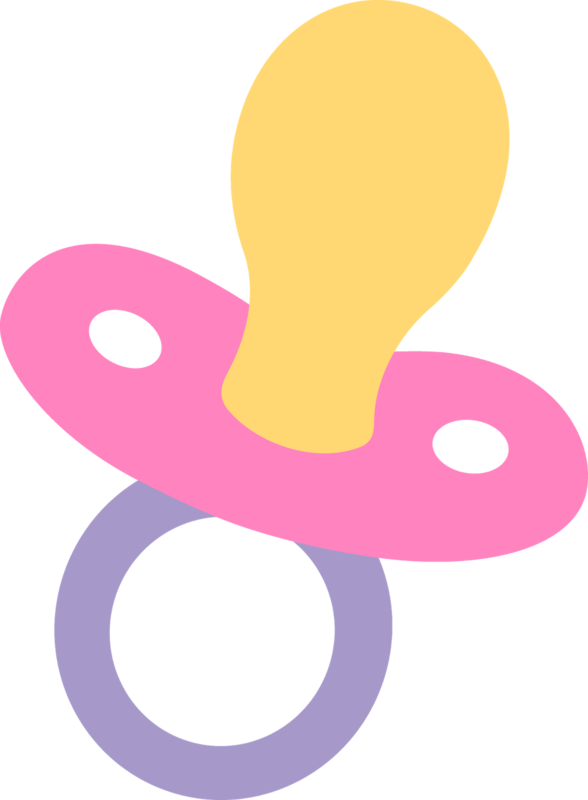 Now you have form a cylinder. If it is not in a nice cylinder shape, just continue roll the bread roll inside the bamboo mat to shape it. 8. Cut the cheddar cheese into quarters horizontally and place them on top of the bread roll, covering the seam. Grill in the oven until the cheese melted and browned, about a minute or so. 9. Cut the bread roll into 1/4 inch and garnish with mayo and toasted sesame seeds. 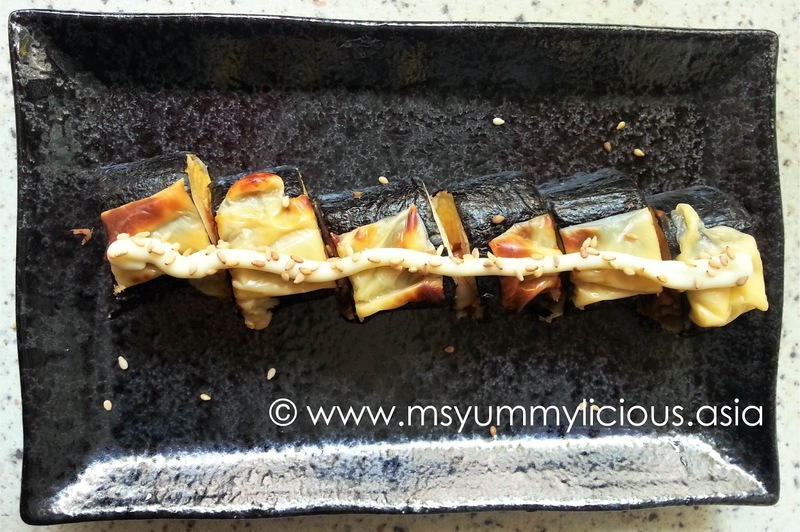 ● You will need a sushi bamboo mat/ makisu to help with the rolling and compressing the ingredients. But if you don't have, you can do it with a tea towel. I've been following Maangchi cooking channel since a year back. She has a lot of good Korean food recipes that are really easy to follow. I've been watching Maangchi so many times that I felt like I've known her personally. Maybe it is because she really connects with her viewers thru the way she speaks. She is very friendly and fun, humble and generous in sharing her secrets and knowledge about Korean foods. For Korean food recipes, Maangchi is definitely the one I refer to (first)! 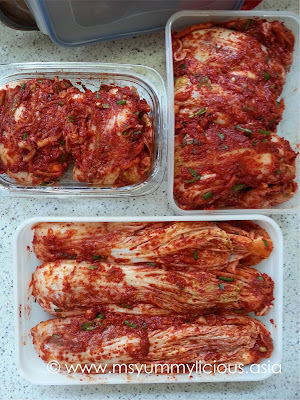 Last week, I make my first homemade kimchi. It may sounds like a lot of works but once you are into it, you wouldn't think so. 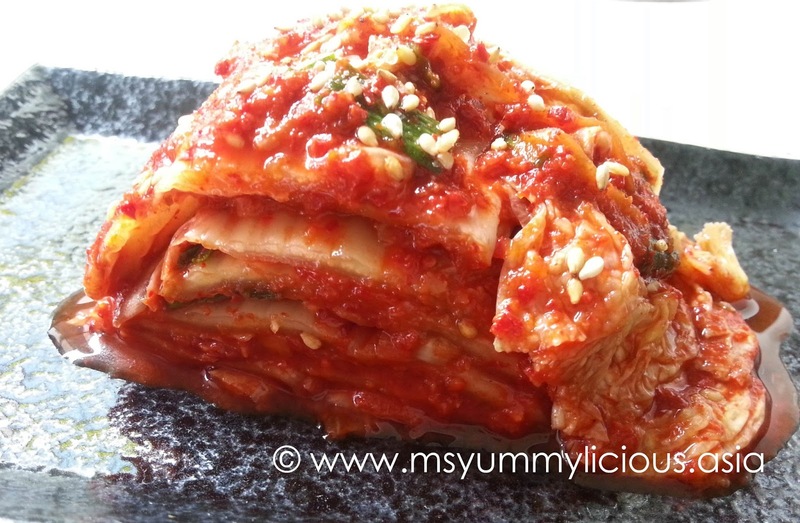 I had so much fun making these kimchi! Supposed the recipe calls for Saeujeot (fermented salted shrimp) but since I couldn't find it, I omitted this in my kimchi. 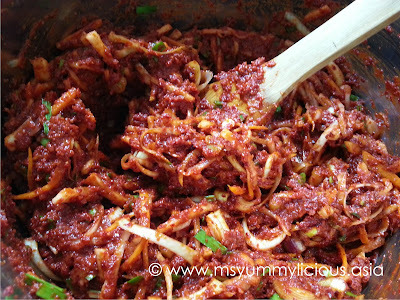 And because my hubby love to eat leeks, I've added a cup of chopped leeks into my kimchi. Making kimchi has many levels of excitement, I would say. Each time i turn the cabbages and see that it has soften, it excites me. And when the aroma from the combined ingredients comes together, it excites me as well. At every stage, each progress, I felt an adrenaline rush and it makes me more energetic. Here are my cabbages. This is at the initial stage of salting. As you let it sits, it will release more water and the cabbage will soften. And here you can see, the leaves are no longer looking as fresh as before. This is at the last stage of salting and the cabbages are ready for rinsing. 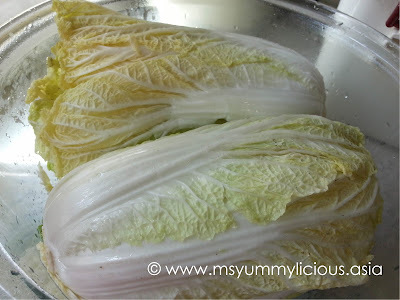 After few times rinsing, drain the cabbages well. You would want just the pure juice releases from the cabbages during the fermentation. This is where I felt really excited. The smell from this paste is so aromatic that I couldn't resist to try some of the paste. It was already so tasty by its own even at this stage. Here are all my kimchi, fitted into 3 containers. If you have an onggi, that would be a better choice to store these kimchi. 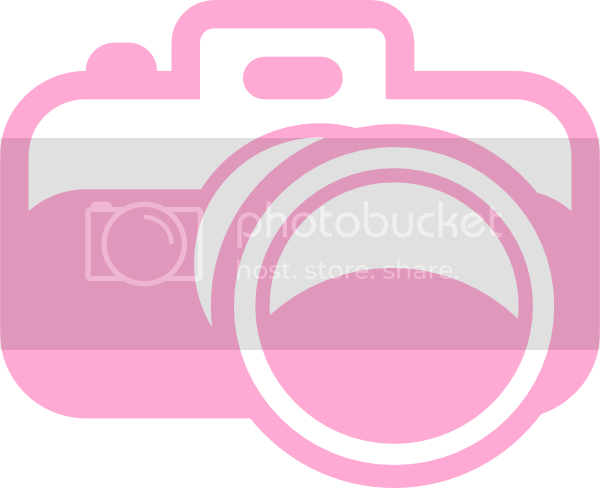 But if you don't have, you can just use BPA free plastic container or glass container. I had some of the freshly made kimchi immediately. 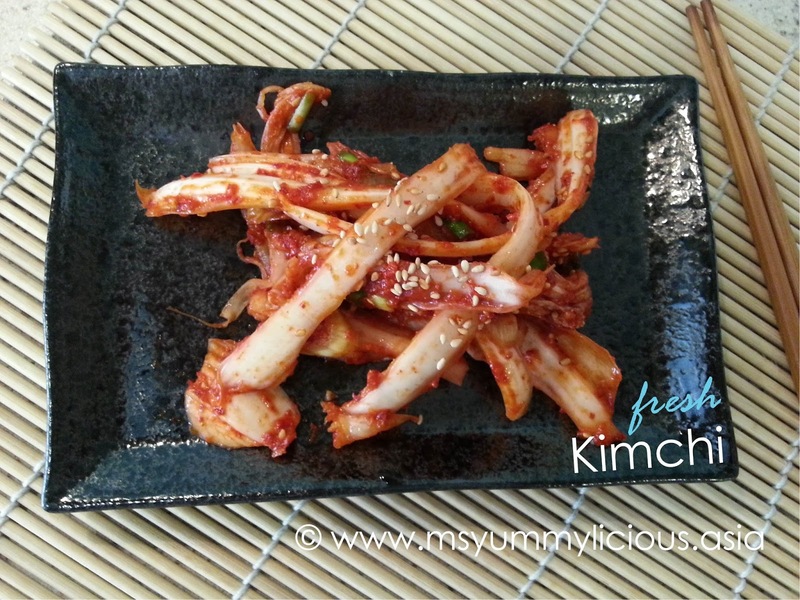 As Maangchi said, fresh kimchi is yummy too! It is crunchy and spicy, very different from the fermented ones as it doesn't have the sour taste. And you can only get to enjoy these fresh kimchi if it's homemade. 1. If the cabbage core stick out too much, trim it off. You will want a flat head. 2. To split the cabbage into halves, make a short slit at the base of the cabbage, around 2"-3", and gently pull the halves apart all the way until it splits open. Now you will have 2 pcs of halves. 3. Cut a slit through the core around 2". Do not make too long slit or else the cabbage leaves will fall apart, detaching from the core. 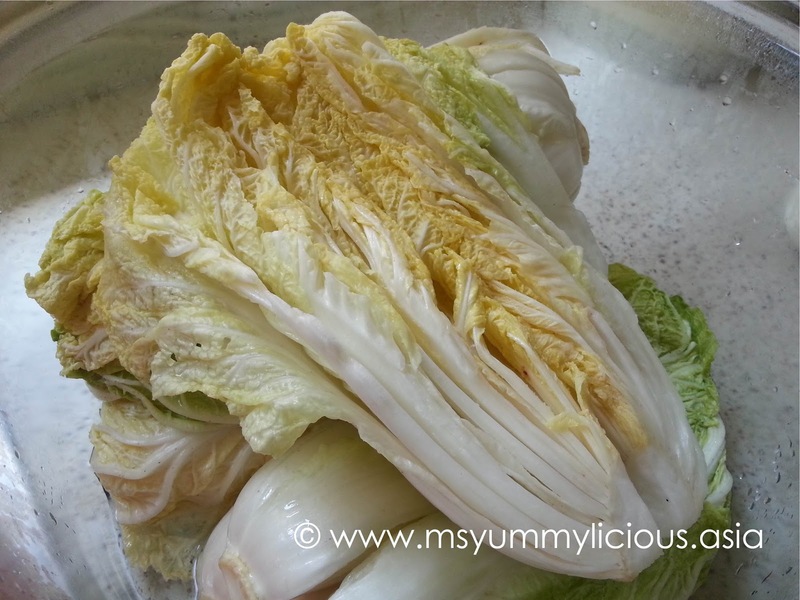 You will want the cabbage leaves to be loose but still attached to the core. 4. Fill a large basin with water and give each halves a good dip in it, so that to get them wet for salting. 5. Sprinkle salt in between the leaves by lifting up every leaf. Use more salt on the thicker part of the leaves. 6. Place all the cabbages in a large basin and let it rest for 2 hours. Turn them every 30 mins for thorough salting. You may scoop some of the salty water from the bottom over to the top of the cabbage from time to time. 7. After 2 hours, wash the cabbages 3-4 times under the running water to remove the salt and dirt (if any). As you wash, split the halves into another halves along the slits you've cut previously. Now you will have quarters. Drain them well in a colander/ strainer. 8. 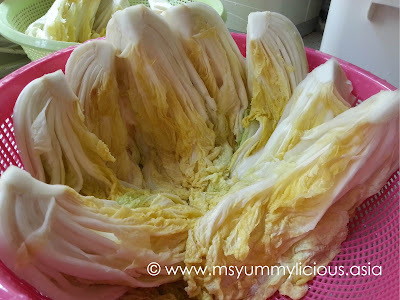 While the cabbages are salting for 2 hours, you can make the paste. In a small pot, combine water and glutinous rice flour. Cook under medium heat for about 10 minutes, stirring occasionally with a wooden spoon. Add the sugar and cook for another 1 minute. Remove from the heat and let it cool completely. This is your porridge. 9. 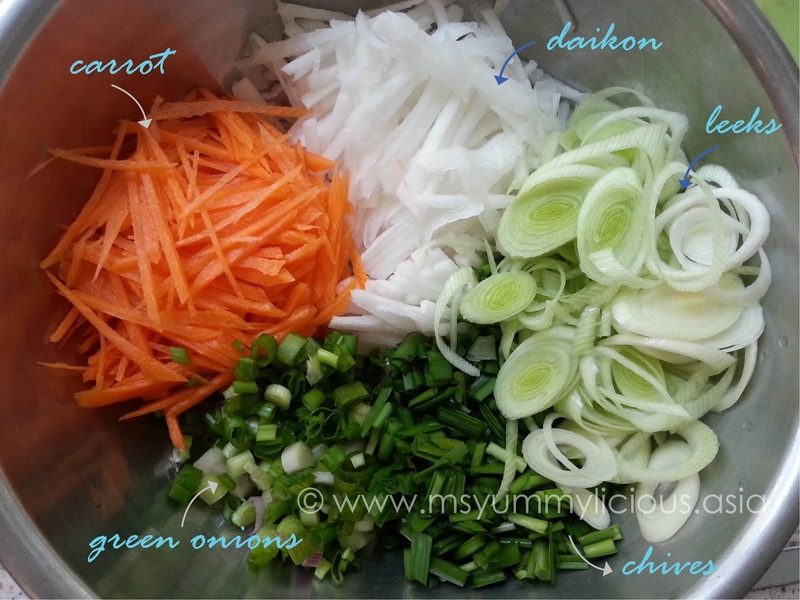 While waiting for the porridge to cool, cut your vegetables into the mentioned sizes. Blend the garlic, ginger and onion into fine paste. 10. In a large mixing bowl, combined the cooled porridge, garlic ginger onion paste, fish sauce and hot pepper flakes. Mix well with a wooden spoon. 11. Add the rest of the vegetables into the paste and mix well until all vegetables are well coated with the paste. 12. Spread the kimchi paste on each cabbage leaf. When every leaf in a quarter is done, you can either fold it half or wrap it around itself into a small parcel and place it in container/ jar/ onggi. 13. 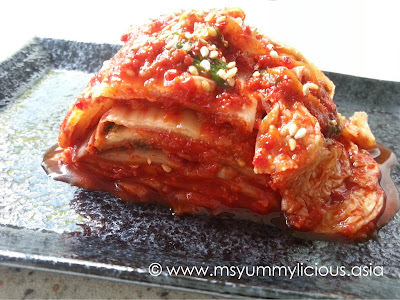 You may eat these kimchi right away or let it ferment for a 4-5 days first in the refrigerator. As time goes, the kimchi will becomes more sour. ● For my hubby and family, this recipe has just the right amount of saltiness. But as for my SIL, she said that it is not salty enough. So, do adjust the saltiness to your own liking when making the paste. ● As Maangchi mentioned, you can keep this kimchi for almost forever. The longer you keep it, the more sour it becomes. But if your family who loves kimchi like mine, the kimchi will be gone in no time. 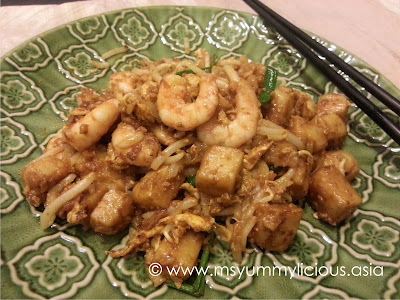 Being able to successfully fried Duck Egg Char Kuey Teow last time with compliments from my hubby, I was very confident that I could pass with flying colors in frying this Char Kueh Kak. But it was a total disappointment! I am not sure where went wrong. Was it the chai poh? Because the chai poh is not fragrant? Or was it because I am not using lard or lard oil? Or maybe it was the seasoning? Hmmm....I should try adding sugar to it in the future. However, I was happy with my steamed rice cake. It is not very mushy nor very hard. Just the right texture for Char Kueh Kak. I will share my recipe here. You may refer to this recipe to make your rice cake. For me, I will refer back to this recipe for my future improvisation. And if you print this recipe, you will only be able to see the rice cake recipe. 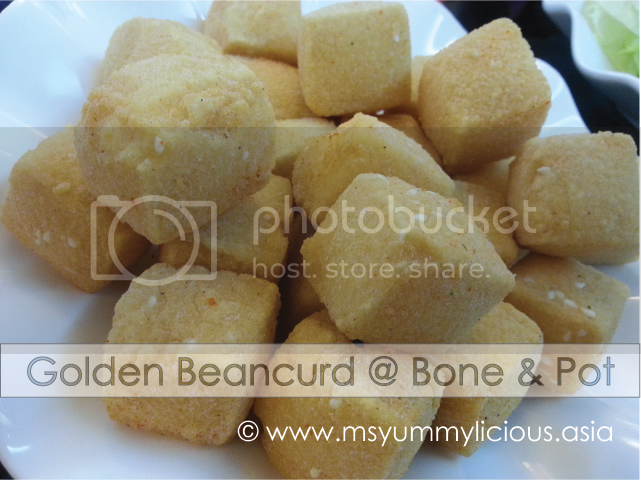 'Someone' (not my hubby) asked me, "Aren't this call Lobak Kou/ Fried Radish Cake?" Well, you see, there was once long time ago, this Lobak Kou seller used to make this dish with radish, hence peoples called this Lobak Kou. But later, he omitted the radish because those who are on Chinese medication cannot enjoy this yummy delicacy (Radish is a BIG NO NO for those on Chinese medication) and his customers were happy with this change. It has been then, his Lobak Kou converted to Char Kueh Kak. Lobak Kou is softer and has more ingredients, where else Char Kueh Kak is firmer but still soft to bite and has fewer ingredients ~ usually it is just chai poh, bean sprouts and eggs. You will need a 9" square pan; greased with vegetable oil. 2. In a mixing bowl, combine rice flour, cornflour, wheat starch and salt. Using a spatula, stir in cold water and mix well. You will have crumbles of dough. Then stir in oil. 3. Gently pour boiling water into the crumbling dough and mix until it becomes a smooth batter. 4. 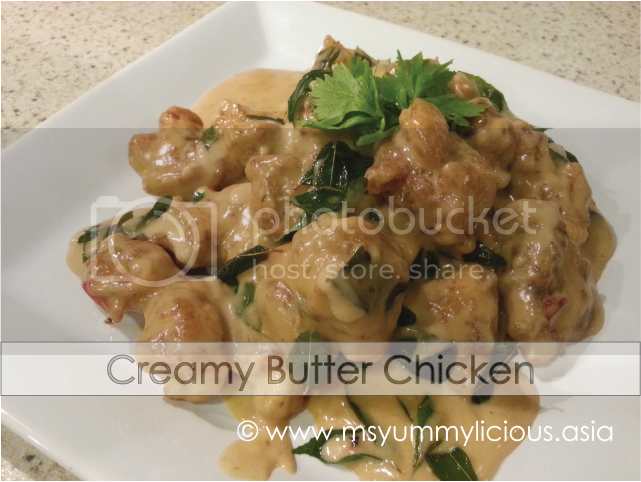 Pour the batter into the preheated pan over boiling water and steam for 35 mins or until cooked. 5. 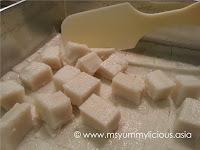 Leave to cool thoroughly before cutting the rice cake into cubes or your desired size. 1. In a wok, heat around three tablespoons of oil on high heat. Add in all the rice cake cubes and approx. 4-5 tablespoons of seasoning mix. Stir-fry untill all the rice cake cubes are well coated with the seasoning mix, approx. a minute. Dish out and leave aside. 2. In a wok, heat two tablespoons of oil on high heat. Add in chai poh, follow by garlic and fry till fragrant. 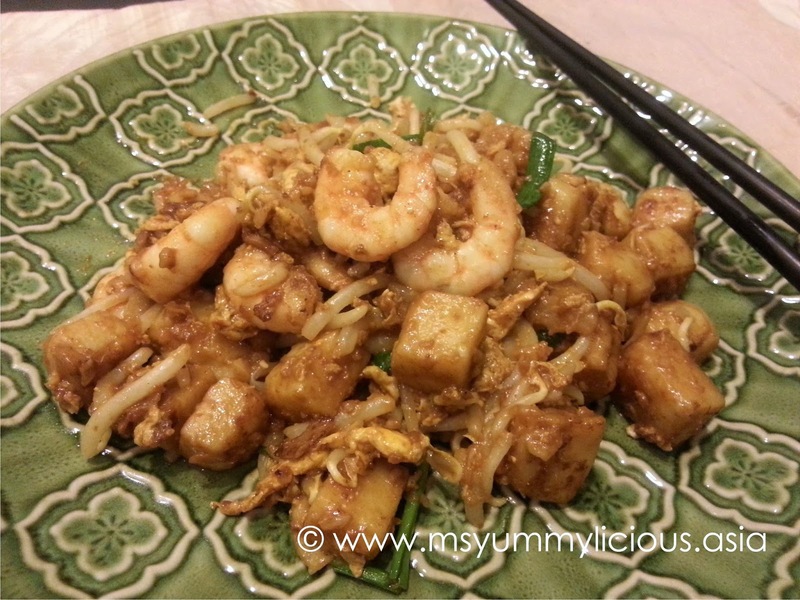 Add in prawn and fry till partial cooked. Make a well in the center, add roughly a tablespoon of oil. Break an egg in the well and spread it with your cooking spatula. Add a cup of the pre-fried rice cake cubes and chives on the egg. Stir in the seasoning and give it a few good toss, then add a handful of bean sprouts. Continue to stir-fry for another 20-30 secs. Dish out and serve immediately.